ECB V8 Ute Racing Series title contenders Ryal Harris and Kim Jane will share the front row of the grid for the opening race at the Vodafone Gold Coast 600. Harris topped the day’s two practice sessions for the penultimate round of the 2017 season in his FG Falcon Ute. He then turned a 1:24.4311s in qualifying to pip Jane by 0.1140 seconds, with the first race to be held on Saturday morning. Harris will be looking to erase bad memories from last year’s Gold Coast round, where he qualified on the front row only for his car to fail on the starting grid. “I was pushing hard, but not over-driving it,” Harris said. “When you look at most other cars in the field, there are panel scrapes and mirrors missing – our car doesn’t have a scratch. “Last year wasn’t fun with the car dying on the start line with an electrical problem, and then being rear-ended. Harris took the points lead at Bathurst from Jane, who is anticipating a close contest in the weekend’s three races. “There’s not much separating us in lap times,” he said. “I probably lost a bit of time in traffic on one of my best laps. “After the championship positions changed at Bathurst, we lost 20 kilos of success ballast and Ryal gained 20, which has really tightened it up. Two drivers are making their V8 Utes debuts this weekend, led in qualifying by former Aussie Racing Cars and Production Cars competitor Gus Robbins in 11th. Michael James was 19th in the ex-Luke Spalding Ute. James said he was thrilled to be on the track with support from the family of Spalding, who passed away last year after a battle with cancer. 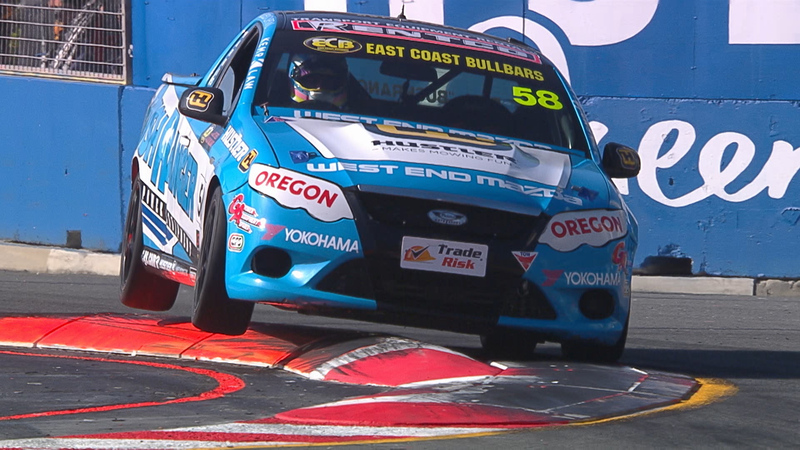 “I hadn’t driven the Ute before practice and I was in the top seven in both sessions, so I was a bit disappointed to miss the top 10 in qualifying,” Robbins said. “I didn’t fully understand how much of a gain there would be with the new tyre, and I didn’t carry as much mid-corner speed in some sections of the circuit as I could have. “It makes Luke’s family really happy to still be involved in motorsport, and still be at the track working on race cars. Marcus Zukanovic’s recent run of outs continued with a crash in the first practice session. Zukanovic subsequently missed qualifying and his Ute has been sent to a local panel shop for repairs. He will start Race 1 from the rear of the field. The first two V8 Ute races of the weekend will be held on Saturday, at 10:25am and 1:15pm.